Eight out of 14 critically endangered black rhinos have died after being translocated from one reserve to another in southern Kenya, according to a statement released by the Kenyan Ministry of Tourism and Wildlife. The rhinos were being translocated from Nairobi and Nakuru National Parks to the newly-created sanctuary in the southeast of the country to offer a more secure location for the endangered species. Preliminary investigations show that salt poisoning may have been cause of death, as a result of the rhinos drinking water that contained a high level of salt – more than what they were accustomed to – in their new environment. The high salt levels lead to dehydration that triggers the thirst mechanism, resulting in excess water intake of the saline water that further exacerbates the problem. Kenya’s Tourism and Wildlife Minister Najib Balala ordered the Kenya Wildlife Service (KWS) to immediately suspend the translocations of the remaining rhinos. The three surviving rhinos who were also moved are being closely monitored by veterinary and park management teams and are being provided with fresh water in temporary water pans. 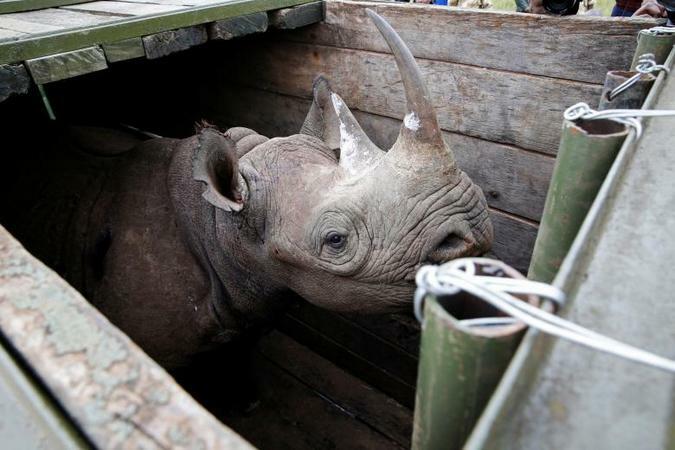 The three rhinos who were due to be moved from Nakuru will remain in the park and are said to be safe and sound. The Kenyan government said the death of the rhinos was “unprecedented” in more than a decade of such transfers. The relocation of endangered animals involves putting them to sleep during transit and then reviving them in a process which poses some risks. According to the ministry, Kenya transported 149 rhinos between 2005 and 2017 with eight deaths. Losing the rhinos was “a complete disaster”, the Kenyan conservationist Paula Kahumbu, of WildlifeDirect, told the Associated Press. Acccording to the ministry, “this kind of mortality rate is unprecedented in KWS operations” and it has invited an external expert from South Africa to join in the investigation behind the deaths. “Disciplinary action will definitely be taken, if the findings point towards negligence or unprofessional misconduct on the part of any KWS officers,” they added.